Even though employers are trying hard to keep up with this, yet there is a huge shortage of talented and skillful digital marketing professionals, according to a recent study from McKinley Marketing Partners. What this means is that candidates interested in making a career in digital marketing have a huge opportunity to break into their dream career. However, you also need to understand that this shortage of active supply isn’t for no reason. Among other things like the ‘hiring reluctance’ on employer’s side, major causes lying with job seekers are the lack of information about the job and the required skills for it. In this blog, we’ll give you some ultimate tips to help you land your dream job in online marketing. These tips are for everyone – the first-timers, and the ones seeking a career change in digital marketing. Don’t fret if you have no marketing specialized degree. Most employers look for candidates with prior marketing ‘experience’, not (strictly) the ‘education’. There are many ways to acquire that experience – whether from a previous job, an internship, or a side project. So, if you’re a recent grad (in marketing or any other discipline), start with an internship at a company or agency that has a department or focus on online marketing. While interning, don’t focus on one discipline. Instead, try your hands in each area of online marketing (if possible), including affiliate, search, social media, and mobile, to name a few. More than anything, learn to think and act like a marketer. Learn everything about your customers and market; use data to make decisions; try to write very good copies; and the most important, never stop acquiring new marketing skills and tricks. The internship will not just help you put something on your resume, but also let you choose a vertical focus or specialty which is important, as you’ll have to select a specific vertical when applying for a full-time job. If you don’t have any referral or have no idea about where to go for interning, you can still get your digital marketing job through the ‘certification’ route. After completing your degree (or simultaneously, if possible), enroll into a digital marketing course, offline or online, as it suits you. Most of the institutions offering such courses have tie-ups with companies who take in the students as interns for a beginning. In most cases, interns are hired as permanent full-time employees if their performance during the internship tenure was considered remarkable. The ‘certification’ route is also a great way for those who are looking for a career change to digital marketing. It will help them acquire the required skills in advance, helping them make their entry easy. Another way to build a perfect resume for online marketing jobs or SEO jobs is to learn the skills on your own. You can do this by starting a serious project of your own, or by working with a local business for free, or for an appreciation salary. Start a website for the business, or your own blog, and apply all the acquired knowledge to date to market it. Start with WordPress, as making a WordPress site doesn’t require any coding knowledge. Design the website with hundreds of free templates, and implement different on-site and off-site SEO techniques, such as keyword optimization, content marketing, to name a few. And, most of all, deliver the results, as that will matter much not just in your resume score but also during the salary discussion. Social media brand building is a very important part of digital marketing. 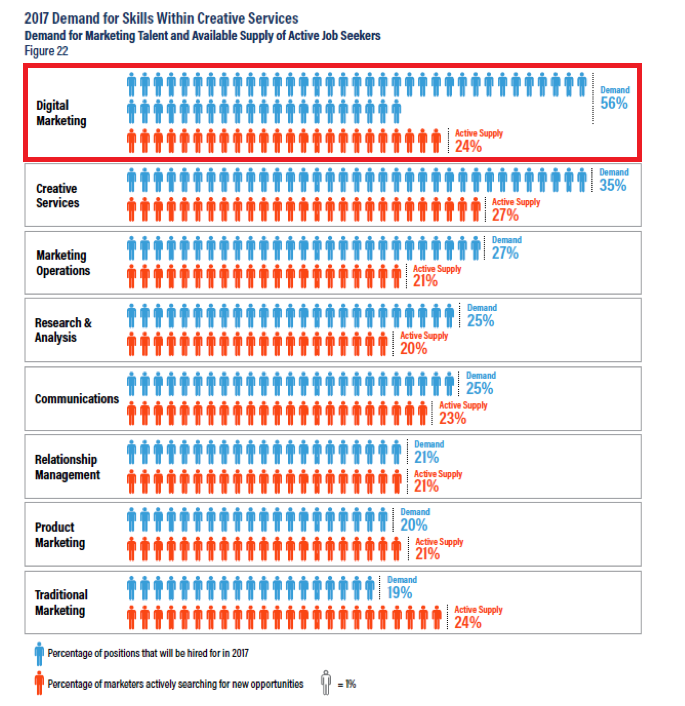 It’s also one of the top skills in demand for digital marketing jobs. For showing your brand building skills, you can work on your personal brand on Facebook, Twitter, and LinkedIn. Have a Facebook page in your name that promotes your hobbies and interests. Regularly update it with innovative posts, or your related activities to extend your audience reach. On Twitter, customize your bio that exactly explains your brand, follow people that go with your brand category, and regularly post for at least 30 days in a row to get the Twitter engine purring along at a good speed. LinkedIn is an even better place to build your personal brand to connect with other digital marketing professionals and employers. Getting professional recommendations on LinkedIn adds strength to your personal brand. Nothing to worry if your professional experience is limited to an internship. You can still get many recommendations of professionals from your company where you worked as a trainee. The idea is to show your employer that because you can successfully build your personal brand, you can build a brand for any client that you may get to work for. Also, learning the top social media expert skills (as required by employers) will help you prepare yourself better for the role of a social media marketing executive. No matter in which discipline (search, social, content, or mobile) you apply for in digital marketing, one common skill that you’ll be required to demonstrate is the writing expertise. You should be well versed in the marketing lingo, still able to communicate with the users in a language that’s simple, and highly expressive of the brand message. What you can do is read a lot of, and a variety of business and ad copies. Learn the copywriting skills, and be a regular contributor to online and offline publications. All of these will help your resume stand taller than those of others in the eyes of the employers. The first paragraph of your resume should be specific to the client/agency and the job at hand. With a little online research, you can learn much about the client/agency you apply for. Your resume should demonstrate how you are an asset to their company. Another way to stand out with your resume is to add certificates. Google offers many certification programs, including Adwords and Analytics. If you’re applying for a role in paid advertising, you can consider getting these certificates. The Google certification programs offer free online tutorials. Don’t forget to add your digital marketing course certificates on your resume, if you have any. Also, make sure your resume is on LinkedIn, and have recommendations on it. LinkedIn is your online resume, so you should optimize it accordingly. Don’t stop there. As much as it’s your job to build a strong resume, it’s also your responsibility to make it reach the right tables. For that, upload your resume to important job portals. Online job portals are also a place where employers directly interact with aspiring candidates. So, grab the opportunity to connect there with your employer. If you get a chance to appear in an interview, make sure to stand out from the crowd by showing your passion and dedication for the specific industry, and in particular, the company you’re interviewing for. The best way you can do that is a good amount of research. While researching, check out their website, social media channels, their mission and vision statement. Also, take detailed notes of any specific points that you think are relevant. Familiarize yourself with their products, unique technologies, and company culture, etc., that you may mention during your interview. Also, don’t forget to research the current trends of the industry to back all your answers with an updated knowledge. It will help you leave a very good impression among the interviewers. Doing these will show two things: First, that you’re familiar with the company and a good match for its needs. Second, that you’re a good researcher, which is of crucial value in online SEO jobs. Digital marketing is a land of opportunities. There is no set limit to how much a talented digital marketer can earn with advancing experience. But like any other field, you’ll first need to enter the game. Following the 7 tips given above, you’ll most definitely find a suitable role in a reputed digital marketing agency or in a company with a focused profile. Your advice to learn the skills on your area by starting personal projects or working with a local business is a good idea. I also like your advice to fill out your resume specifically to the agency and the job you want to show that you’ll be an asset. A great way to find jobs and get information on them would be to work with digital marketing recruiters so you can find out which companies are hiring and what they’re looking for to figure out which positions would be a good fit for your skills.